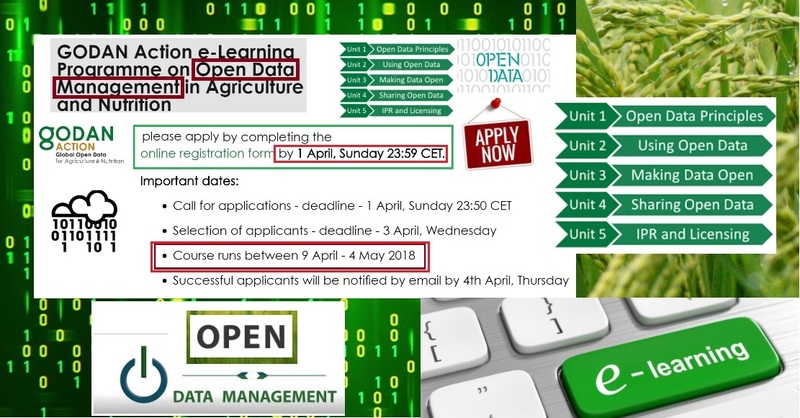 Following on from the successful first round of GODAN Action's e-learning course on Open Data Management in Agriculture and Nutrition, we are pleased to re-open the applications for the second round. This e-Learning course aims to strengthen the capacity of data producers and data consumers to manage and use open data in agriculture and nutrition. One of the main objectives is for the course to be used widely within agricultural and nutrition knowledge networks, in different institutions. The course is open to infomediaries (including ICT workers, technologist-journalists, communication officers, librarians and extensionists), policy makers, administrators, project managers, researchers and scientists working in the area of agriculture, nutrition, weather and climate, and land data. The programme is provided in English and lasts for four weeks. Participants are expected to spend eight hours weekly on average to complete lessons and engage in activities such discussion forums and webinars. Please note that by applying for the course, applicants declare that their supervisor/manager/the person to whom they report at their workplace approves their participation in this online course, and allows participant to dedicate about 32 hours in total during the for weeks of the course. Please click here for more information about the course and please apply by completing the online registration form by 1 April, Sunday 23:59 CET. !!! 5 April 2018: GODAN/GFAR/CTA Webinar "DATA DRIVEN SERVICES for FARMER led BUSINESS" !!! !!! GODAN Action Training Mini-Grants : Apply by 7 May 2018 !!! The 2018 Global Food Policy Report (20 March 2018) looks at the impacts of greater global integration through trade, investment, migration, open data, developed country policies, and governance – that can be harnessed to benefit our global food system.